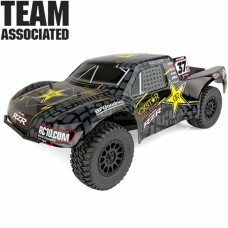 Team Associated's new ProSC10 is a Ready-To-Run RC replica of the Pro 2 trucks driven in the Lucas Oil Off Road Racing Series. The ProSC10 features a rear motor short-course chassis that utilizes many of the same parts from the widely successful RC10SC5M platform. Adjustable aluminum big bore coil-over shocks, a sealed-gear differential, and heavy-duty CVA driveshafts are all features that come standard on the ProSC10. A powerful water-resistant Reedy electronic speed controller and 3300kv electric motor power the ProSC10 for hours of high speed fun. To handle the power, the ProSC10 comes equipped with realistic Method(tm) Race Wheels and tires specifically made to handle any off-road condition. Please Note: This kit requires the following for completion: 4 x AA batteries (AS302 Reedy AA Alkaline) used in the transmitter, NiMH or LiPo battery with High Current T-Plug (AS724 Reedy 7-cell WolfPack or AS751 Reedy WolfPack LiPo recommended), Charger for battery used (AS27201 Reedy balance Charger - good for LiPo, LiFe - recommended).